You might think I'm mad but...: Now that life has begun. Now that life has begun. Imagine a girl, curled up in a big chair in the corner of a room, a laptop sits on her knees and as her fingers glance over the keyboard, her brow furrows in concentration. A question has stumped her - she isn't sure if she understand the grammar point in question. This is me about a year and a half ago in the midst of the last leg of the journey that has led me to where I am today.Truth be told, the journey of me arriving in Korea and teaching here travels back to the aeons of time and not just to September 2011 when I started studying for my TEFL Qualification. Some of my favourite books as a kid (and beyond, I must admit) were the "Chalet School" Stories by Elinor M Brent Dyer. I loved those books about girls attending a boarding school in Austria and I always had "time to spare" to reread them. I played games in my head where I designed schools, curriculums and imagined teaching my students. Oh, the adventures we had! As I grew up, my desire to be a teacher did stick with me as my work experience in Secondary School was spent at a local Gaelscoil. However, I hadn't done well in my Leaving Cert so when I finally went to college in 2002, I wasn't 100% sure what I wanted tout of life. I thought (considering my love for books) that maybe I wanted to be a librarian eventually. In truth, I would love to be a librarian or a bookshop owner at some point in my life but reality has a way of kicking you in the bum. Digital is the way most books are going and libraries aren't as popular as they were many moons ago. I remember how, even as a kid, we seemed to be the only kids in our neighbourhood who frequented the several local libraries constantly. Reading just isn't as cool as it once was and with the ever increasing amount of television shows, computer games etc books are fighting what seems to be a losing battle. Even in my own family, I've one brother who came to reading quite late compared to the rest of us ("Harry Potter" reeled him in) and one sister who really doesn't read at all (her favourite book is "Black Beauty" which is the only book she (semi) voluntarily read as a child). However, I worked in the library when I was in college so partly, this dream has been fulfilled. Then, I graduated. I started working at a car rental company in the HR department and I realised that teaching was something that I not only enjoyed but was good at. I trained in a lot of work experience / interns and coworkers over the years as well as two people who would go on to manage me. When the time came (after 5+ years) for me to decide what I wanted to do with my life outside of HR (I realised it wasn't something I wanted to do forever), it's probably not surprising that I chose to Teach English as a Foreign Language in Korea. As I look back on this year, I realise that I have come a long way and I'm so glad that "[I] let me go...[so that I wasn't] stuck in the same place I've always been". When I arrived I was so nervous. Leaving Ireland had left me emotionally exhausted (see post: I left on a Jet plane ) and I didn't think I'd adjust as easily as I did. I've had an amazing support system from the get-go: a fantastic brother, amazing co-teachers, wonderful friends who have become like family,as well as outstanding family and friends at home...and I've had my determination to make this a memorable experience. 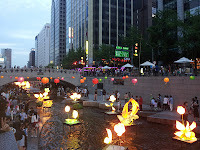 Korea (as with any experience) is what you make of it. And for any experience to be a success you have to let go a little and enjoy it, have a bit of determination to stick with it and a desire to actually experience it. 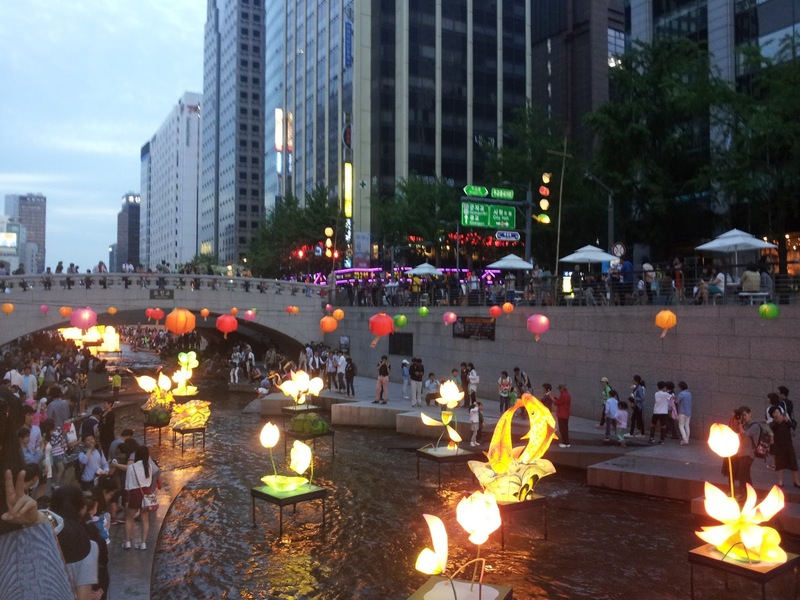 In Korea, you have to embrace the culture just a little bit to truly enjoy it here - whether you start watching K-dramas, listen to K-pop (and not just PSY), or embracing the whole Kimchi Experience. There are tons of things to do and see, people to meet and experiences outside of teaching to be had. When I first came here, I'd never gone somewhere on a vacation by myself and definitely not to somewhere I'd never been before. 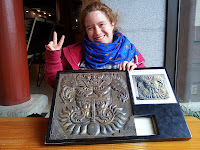 Well, I managed to enjoy myself in Korea visiting Seoul museums and spending 5 days alone in Gyeongju (see post: I did survive). I know it's not my favourite way to do things but I learned HOW to do that here. I've learned how to use a smartphone - anyone in my family will tell you when it comes to phones the simpler the better! I've learned a new language and while I am far from proficient I can now use a taxi to get from A to B, I can order my food/drinks and I can understand a few phrases my students throw at me or random strangers ask me. I've learned that acting the eeijit is a completely legit way to entertain children and the sillier you are the funnier they find you. I've learned games are the best way to get kids to practice their vocabulary and that sometimes you need to just drop whatever lesson you had planned and go with the flow. As long as they speak English the main objective has been reached. Other ways that I have grown are too numerous to count but a few examples are as follows. I've grown more comfortable in my own skin. I am learning how to live by myself, completely - this means doing my own laundry, paying bills on time, waking myself up everyday etc. I only answer to myself. If I forget to pay a bill, the only person that is on is me. When I've lived in accommodation at home, I was responsible for paying bills but only my share. If I were late, someone would always call me or knock on my door. I had stress in my old job but I never pulled something out of thin air before - I have learned to do this consistently in Korea - sometimes a lesson just isn't going the way you want it even if you have the best class in the world. Sometimes, you need to change gear and start doing some thing new to get the kids to focus. So you might think I'm mad but I feel that I have gotten a lot more out of Korea than I have given to Korea. You might think I'm mad to believe that acting the eeijit is a legitimate way to entertain children and that it's definitely worth it. All, I know is that this has been an incredible year that I wouldn't exchange for the world despite the "usual morning lineup" of my daily life. I no longer need to "wonder when will my life begin". For me the "lights [of opportunity] will [keep] appear[ing]" and I am getting lots of chances to go "out there where they glow". PPS: This post was inspired by the song "When will my life begin" which is sung by Mandy Moore in Tangled. 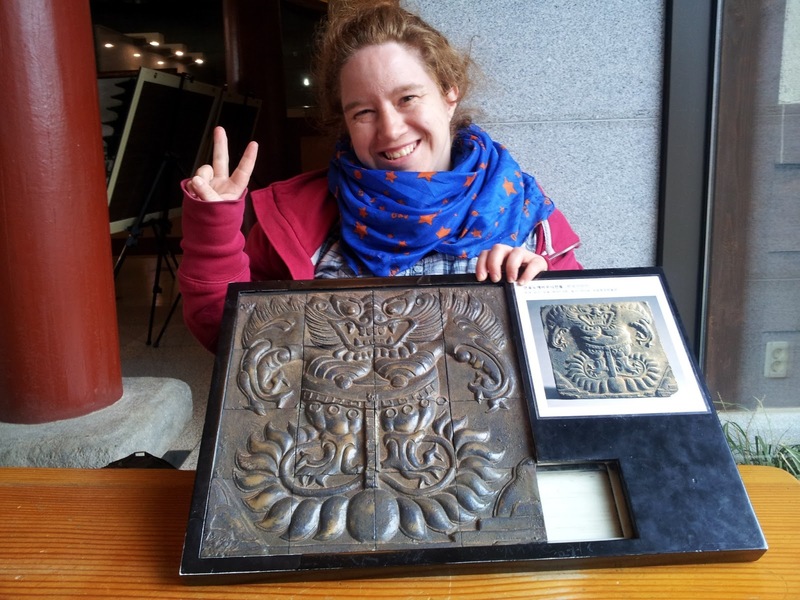 a puzzle and doing one of the Kimchi poses.